Looking for something fun to do with the kids? Want to get started on your Christmas gift list? Need some new decorations for your coffee table? Not only are candles beautiful, they can be very practical as well. Every home should have candles available should power go out. You can save money on electricity by replacing lights with candle light as well. Take this opportunity to talk to your kids about being green. Time: 60 minutes, excluding waiting time. Age: 5-10’s, Over 10’s, excluding preparation. Order materials online or go to your local craft store. 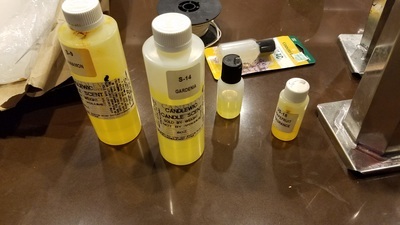 Candle making is becoming a lost art. The major craft stores in my area stopped carrying most of the supplies due to low demand, make sure to call ahead. Additionally, consider who you are making the candle for. If you have a family member that is sensitive to paraffin, you can use soy wax instead. Soy wax produces virtually no soot and is a greener alternative to paraffin wax. Unfortunately soy wax does cost a bit more than paraffin wax. 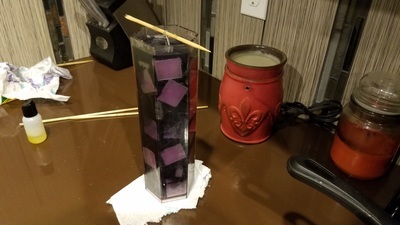 A medium sized pillar candle uses about one pound of wax. Place the slab on your driveway or in your garage. A hard surface helps a bunch. Lay down newspaper or grocery bags underneath the slab to protect the wax from getting dirty. Take a knife and score the slab into ten even pieces. 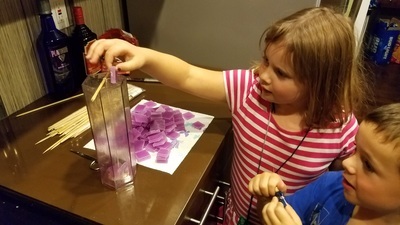 You’ll want to score the same lines several times to cut through about a ¼” of wax. Flip the slab over and release some tension (by hitting the slab with the hammer). If you have scored the other side deep enough, the slab will easily break along the lines, providing you with 10 equal blocks of wax. 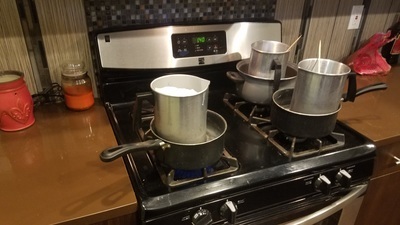 Fill the large pot halfway full with water. Place the metal pitcher inside the large pot. 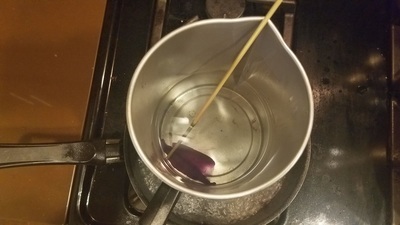 Place a brick of wax into the metal pitcher. Turn the oven range to medium heat and watch the wax melt! Place your dye or full unwrapped crayon into wax. 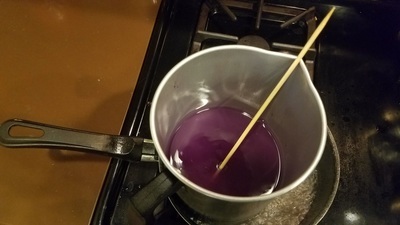 Use a wooden stick to stir in the color completely. 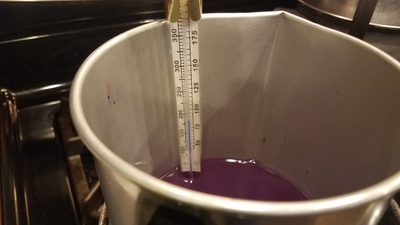 An ideal temperature for pouring paraffin wax should exceed 180 F.
Use a candy thermometer to check the temperature. 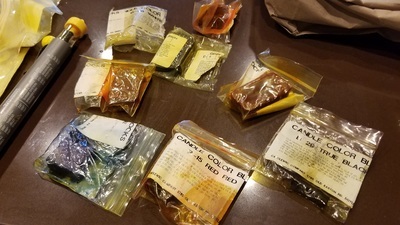 Different waxes have different melting points. Place newspaper down on your counter. Set a cookie sheet on the newspaper. 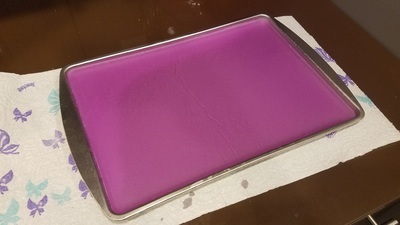 Pour the colored wax into the cookie sheet. One pound of wax fills a standard sized cookie sheet perfectly. Allow a few hours for wax to harden completely. 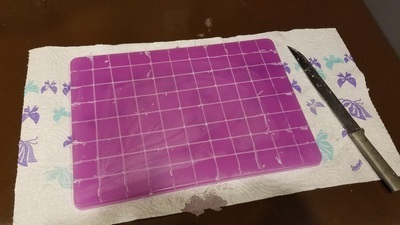 Take your knife and score the colored wax into 1” - 2” squares like you did for the wax slab. Instead of using a hammer, simply break apart the blocks with your hands. Repeat these steps to create as many different colored blocks as you would like. 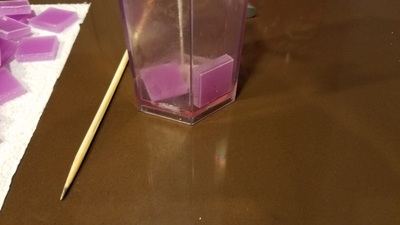 Turn your mold upside down and insert wick into the hole at the bottom. 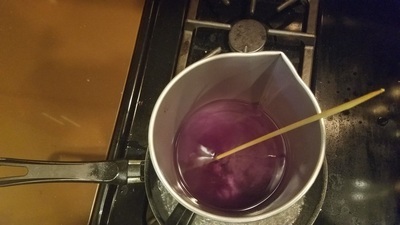 Pull the wick through the mold past the opening, leaving several inches of extra wick. 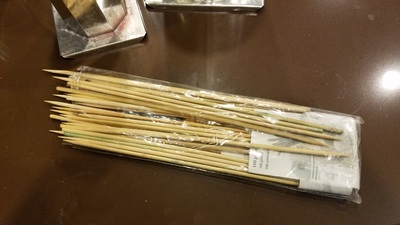 Take a wooden stick and tie the wick around the middle of the stick. 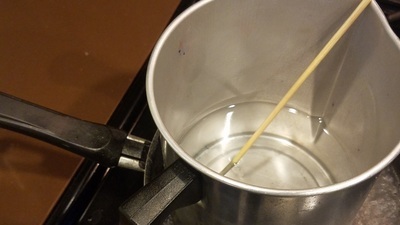 The wooden stick should be larger than the diameter of the mold, holding the wick in place. Pull the wick from the bottom of the mold. 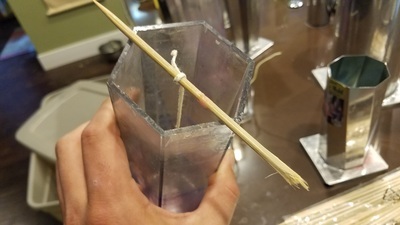 With the wick taught, place your finger on the bottom of the mold, holding the wick in place. While keeping the wick taught, place sticky tack over the hole and wick, covering the wick completely. 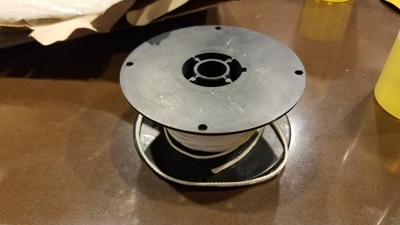 This will hold the wick in place and prevent wax from leaking out the bottom of the mold. Repeat these steps for every mold that you have. This is when you should include your kids. Have your kids carefully place the colored blocks into the molds however they would like. 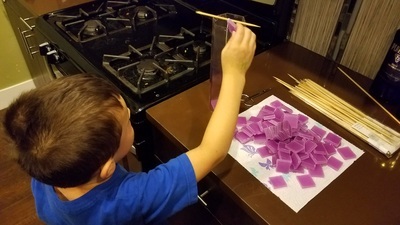 Blocks that are placed snug against the inside of the mold will show in the finished candle, you can create different designs and color schemes this way. The bottom of the mold will be the top of the candle. Place the prepared molds on newspaper on your counter. Ensure that the molds won’t be bumped or moved during the hardening process. 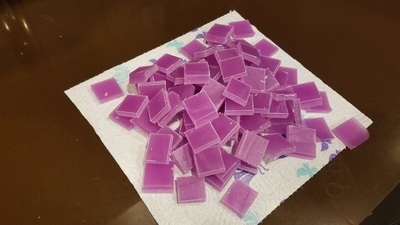 Fill Molds With Wax (add scent). Wax is very hot and should be poured by an adult. Repeat step 2 using a couple of blocks of wax. This is the wax that will be poured into the prepared molds. You can leave the wax clear, or dye it whatever color you like. Right before you begin to pour, add candle scent if you have some. You can also experiment with essential oils. Using oils will create a marbleized look and can provide therapeutic value as well! Carefully pour the wax into the molds. If you have filled the mold with blocks you are done. If you haven’t completely filled the mold with blocks, you will need to add more wax as it dries. (Candle wax shrinks) Remember that this will be the bottom of the candle. Allow several hours for candles to completely harden. Wait until the sides of the mold are completely cool. The more blocks in your candle, the quicker it will cure. Once candles are ready to be removed from mold, turn upside down and remove the sticky tack. Slide the stick out of the knot or cut the wick off. The bottom of the mold is the top of the candle, don’t cut that wick. 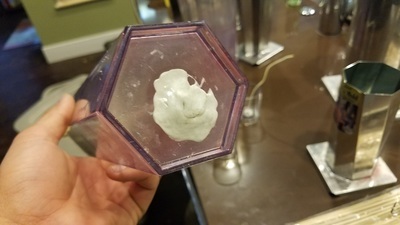 With the mold upside down, carefully tap the candle out of the mold. The candle should slide right out if it is completely cured. Use nylon tights to buff out any imperfections if you would like. Candles are to be respected and can pose a fire danger. Be sure they are out of reach of small children when lit and that they are not left lit and unattended. Check back soon for my next article titled “Advanced Candle Making with Kids”. Don't have a metal pitcher? Use an old metal coffee canister and pinch the edges to make a spout. These candles make wonderful Christmas gifts! In fact, my friends and family have come to expect a candle for Christmas. 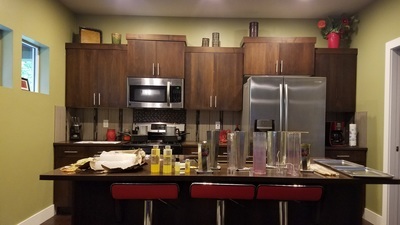 It is really neat going to your friends house and seeing the candle you made proudly displayed on their coffee table or as a centerpiece on the kitchen table! For Christmas, I try and pick colors that go with the recipients house color scheme. I also tie a ribbon around the candle when I give them as a gift.